We also offer non-medical feline boarding. 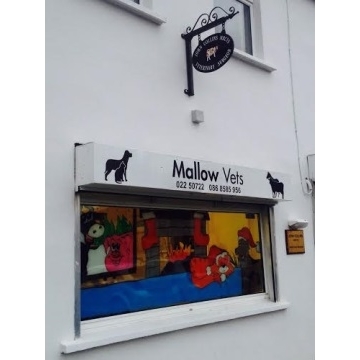 As a vet with special interests in feline medicine, I can assure your friend shall have a stress free and comfortable stay at Mallow Vets!. I offer most competitive rates and will gladly cater for long or short stays. My cattery room has plenty of hidey holes, nooks and crannies for for your cat to lie low until the dust settles!. For those pets who don't drive or whose cars have failed the NCT, I can conduct house visits so the care and treatment of our elderly, debilitated or shy four legged friends can be easily facilitated and arranged. Simply phone me on (022) 50722 or (086) 8585956 to discuss. My aim is to make your life easier. House visits provide me with an ideal opportunity to observe your friend in it's everyday environment. Such observation is especially beneficial when confronted with behavioural issues. What died in your mouth? We want healthy teeth and gums for our pets. Cats and dogs' teeth were designed to incise (cut) and masticate (chew) all kinds of foods. They need to built and maintained well. Fido will lose his love for the butcher's bone if he can't chew it! Felix will pass on the filet of rabbit if he has a toothache! A gummy smile is loved by no-one. Plaque and tartar build up are capable of causing many more issues within your pets body than just bad breath. We offer routine teeth cleanings as well as extractions and gum care if needed. . Allow me to care for your pets' teeth with regular exams and cost effective dental treatments and procedures. Full Service Laboratory — Give it to me straight Doc! I have engaged the services of a leading veterinary laboratory in Cork to provide highly reliable, standardised (trust worthy), informative and cost effective laboratory services. All blood and tissue samples submitted to the lab will be reported upon via email within 24 hours. This enables me to make the best , most informed decisions about your animal's state of health. Ultrasound emits sound-waves that are reflected from tissue and converted into electrical energy. The electrical energy is recorded and displayed on a monitor so that we may evaluate the internal organ architecture. Pets often do not need to be sedated for ultrasound, but hair is often clipped and your pet spends part of the day with us if necessary. I have extensive experience in pregnancy diagnosis and foetal evaluation using this exciting technology! A full abdominal ultrasound can be scheduled and performed at Mallow Vets at your request. Permanent identification — Guess Who I am? I offer microchip implantation at the owner’s request. The microchip can be placed during an appointment or during surgical procedures already scheduled to aid you in relocating your pet should they get lost. This form of identification is permanent proof of ownership, unlike collars that can be lost or broken. Microchip scanners are available to many local animal care and humane societies, allowing local authorities trace a stray pet back to their rightful owner. Full access to specialists in many disciplines — Phone a friend for free! If there is a diagnostic test, treatment or procedure required that may not be offered at my practice, I can defer to a wide network of specialists in the fields of dentistry, dermatology, internal medicine, orthopaedic or soft tissue surgery, ophthalmology, radiology ultrasounds and MRI. At Mallow Vets, my goal is to achieve the very best care for your beloved friend. My fees are highly competitive and I am ever mindful of the enormous financial pressure many may find themselves exposed to. Where the treatment or procedure proves costly, pet insurance may help lessen the burden on you, the pet owner. There are number of providers in the Irish market. Each will have it's own terms, conditions and exclusions; allow me to advise. Ensure yours stand out from the pack! I can advise on all matters relating to your hounds. Ensuring an effective worming strategy is of paramount importance in those kennels that are being fed on flesh. Certain parasites can be acquired through this means of feeding large packs of hunting dogs. Examination of the stools of some dogs in your pack can guide our worming and parasite treatment protocol.Occasionally, a dog can get lost after a hunt; being pack animals, the subordinates (at the back of the pack) can lose their way if they lose sight of the more dominant dogs. I have built up an excellent network of contacts from many of the hunts in the greater Cork area and have often returned lost or missing dogs to their pack; allow me to advise. I offer a wide range of monthly worm and flea/tick preventatives specialised for your pet’s lifestyle and your household’s needs. I can advise on dosing frequency, efficacy (will it work and how well?) and duration of action. I offer many shampoos for the special pet with skin problems. In addition, many recommended supplements can be dispensed during your appointment for you to try at home. These may be requested or recommended during appointments and are available at that time for you to take with you.